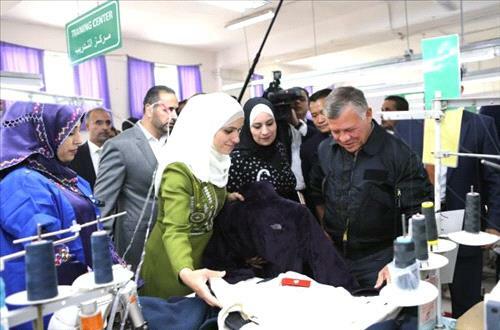 AMMONNEWS - His Majesty King Abdullah II on Wednesday visited Jerash Garments & Fashion Manufacturing Company in the industrial complex of Sahab, which exports its textile and clothes products to the United States and European Union markets. Established in 2000 with three factories, the company provides about 800 jobs for Jordanians, including 50 opportunities for people with disabilities. During a meeting with the company's chairman and senior officials, His Majesty expressed pride in the company's achievement for its listing on Nasdaq in New York, in which its shares will be traded on the global exchange on Friday, May 4th, becoming the only Jordanian and Arab company traded on Nasdaq. His Majesty affirmed his support for the companies that carry out investment projects in various regions of the Kingdom and the importance of providing an appropriate investment environment to enable them to overcome any challenges or obstacles that may face them. The King highlighted the Jerash company's role to help local communities benefit from these ventures, which positively affect the process of economic development. During the visit, King Abdullah congratulated the workers on Labor Day celebrated on Tuesday, expressing his great pride and appreciation for their efforts in building the country. His Majesty pointed out the importance of involving Jordanian women as a key element in the production process, and the need to empower them and boost their role to increase their contribution in the Jordanian economy. His Majesty toured the factory's facilities and was briefed on the future plant's plans, which include the establishment of a new garment factory in the Al Hasa region, which will provide about 500 jobs for the region's women after they receive the necessary training. The factory in Al Hasa has facilities including sports courts and a nursery for the benefit of the local community. His Majesty also listened to a briefing from the Jerash company's Chairman of Board of Directors, Li Ming Hung, on the progress of the production process, in which its products are characterized by high quality enabling it to compete globally. After reviewing the company's growth and successes, Hung said its listing on Nasdaq is a good example of investment and opens the way for Jordanian companies to enter international stock exchanges. Hung pointed out the company's listing on the stock exchange, as well as Jordan's security and stability, and the competitive privileges of the Jordanian economy, stimulated the company to move forward in expanding its investments in the Kingdom, thus increasing employment opportunities for more Jordanians. He said the company's Jordan-made garments products win interest of consumers in the US and European markets, and noted the company works within the framework of social responsibility to contribute to the development of local communities, through training programs for the purposes of employment. The meeting was attended by His Majesty the King's Advisor, Director of His Majesty's Office, Minister of Labor, State Minister for Investment Affairs and Chinese Ambassador to Amman. In press remarks, Hung said the Jerash company has expanded its operations since its establishment in the Kingdom, where it has grown from a 300-strong factory to a plant that currently employs about 3,000 workers, Jordanians and non-Jordanians. With regard to the company's shares trading on the US Nasdaq, he stressed the importance of this step in enabling the company to increase its financial resources, which will contribute to the expansion of its business and investments in Jordan, and pointed out the company, within its expansion plans, will build factories in other regions of the Kingdom and will start by launching a factory in Al Hasa, which provides 500 jobs. On the occasion, Minister of Labor, Samir Murad, said Jerash Garments & Fashion Manufacturing Company is the most important Chinese investment in the Kingdom and provides many job opportunities for Jordanians, and added the Ministry of Labor pays particular attention to the garment industry as it has a key employment role.